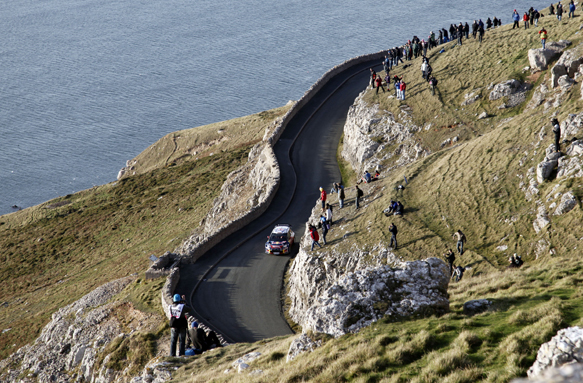 Last weekend was Rally GB time – and Britain's round of the World Rally Championship produced an event as dramatic as any in recent memory, on stage and off. David Evans recounts how the title battle stayed on the boil until Mikko Hirvonen dropped out while scrapping for the lead with Sebastien Loeb. That guaranteed an eighth WRC title for Loeb, but his rally ended when his Citroen crashed into a car being driven by a Spanish spectator. Away from the stages, the deals that will send Hirvonen to Citroen and Ogier elsewhere were completed, and this story is also covered in detail in AUTOSPORT magazine, as well as Loeb's immediate reaction to his crowning as champion yet again. Abu Dhabi Grand Prix report - Lewis Hamilton really needed this. Everyone expected the Abu Dhabi GP to be a Red Bull/Sebastian Vettel cruise, but a first-lap tyre failure for the German gifted a chance to Hamilton. Mark Hughes recounts how he took it, but not without having to complete a fine drive in which he was constantly under pressure. And he gives the detail behind similarly exceptional performances from Hamilton's McLaren team-mate Jenson Button and Ferrari's Fernando Alonso. 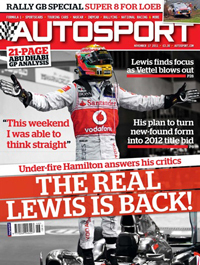 Williamson's prize test - Lewis tests a McLaren! But this time it's the wee Highlander Lewis Williamson. Fresh from his GP3 season, the Scot headed for Silverstone to get his dream day – part of his prize for winning the 2010 McLaren AUTOSPORT BRDC Award. Kevin Turner, one of the judges of the Award, was there to download him. ILMC, Zhuhai - It was the final instalment of Peugeot v Audi in 2011. Although the battle was fairly close early on, it soon moved into the favour of the French, and Sebastien Bourdais drove to victory with Anthony Davidson. Gary Watkins brings you all the background from China. From the archive - It's Macau time this weekend, so time to release another pearl from the archive – and this time it's Tom Walkinshaw winning the Guia race in a JPS-liveried Jaguar XJS. Nice. Race of my life - Miguel Angel Guerra – he of shortest-career-in-F1-history fame – talks about the 1978 Donington European F2 round in his Chevron-Ferrari. Also nice.